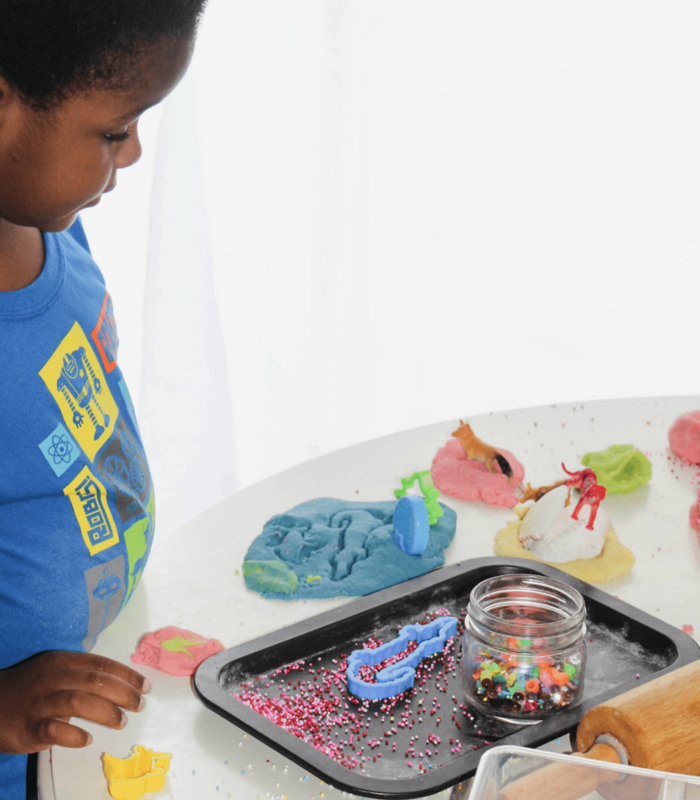 Does playdough ever go out of style with little kids? I don’t think so. 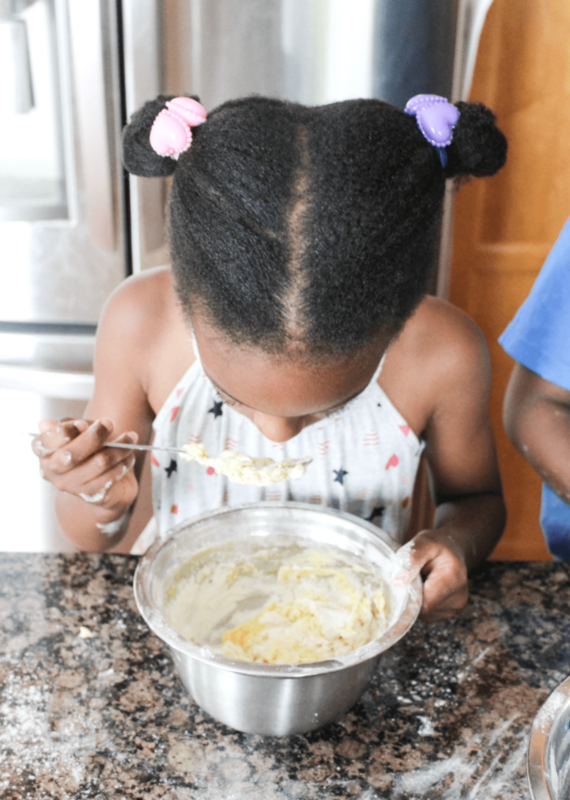 Our kids tend to enjoy them anytime. 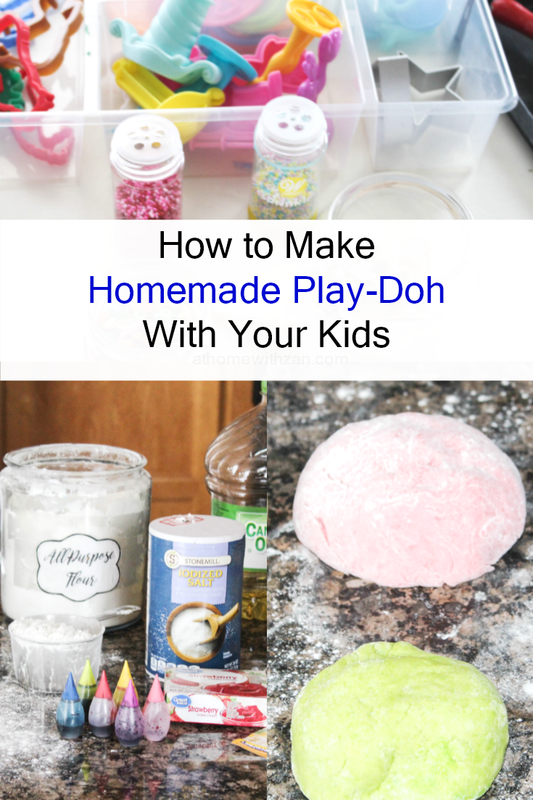 It’s summer and while we visit the park frequently along with other outdoor family activities I thought we should have some playdough on hand for when they are home and something different than their toys. We’ve been making them frequently but it’s been a few weeks since we’d made a new batch due to moving to a different home. 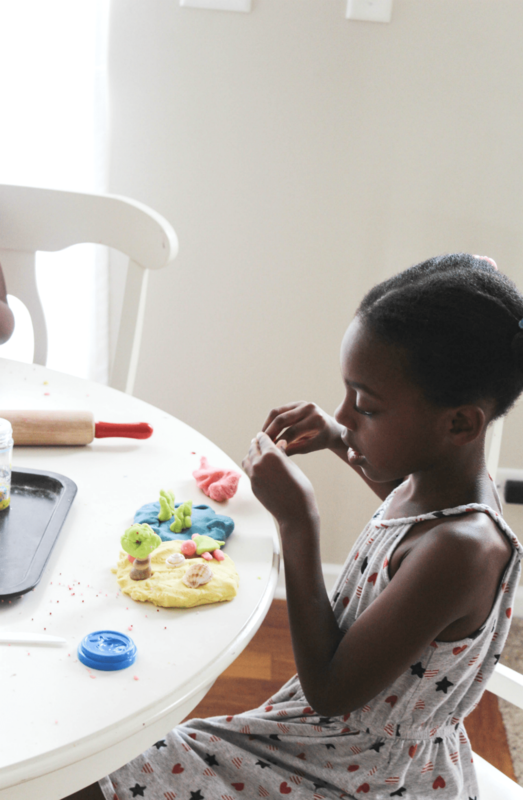 The good thing about playdough is that you can make them with staples from your pantry. I find it more economical and customizable. Add in anything for a different color, scent, season, etc. Not to mention, they’re “safer for kids who still like to put stuff in their mouths. I have occasionally bought playdough but somehow they always end up dried out or mixed up in untasteful colors. Not the store’s fault. 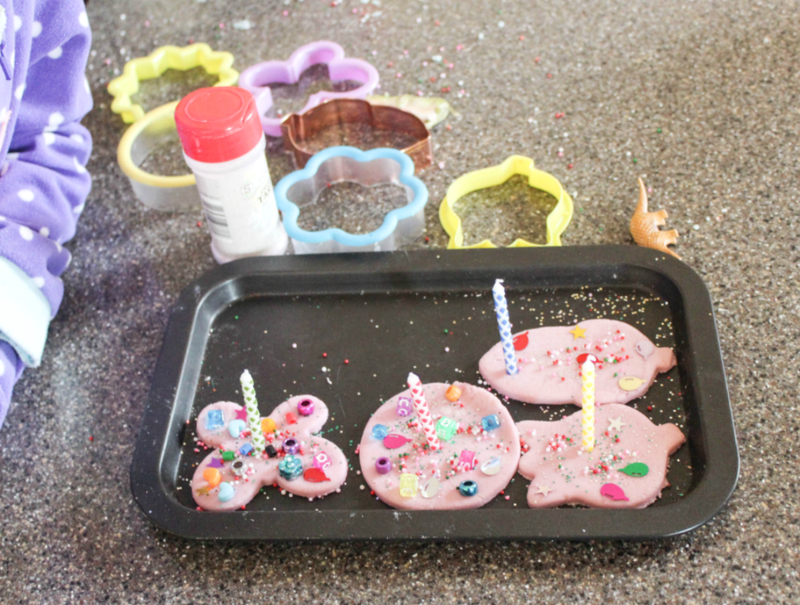 It’s only that all the fun little buckets of playdough seem like the perfect thing to combine. It will look fine at first like a rainbow but eventually with over rolling turns into colors that they don’t enjoy. When that happens it’s usually time to throw them out and of buy more. 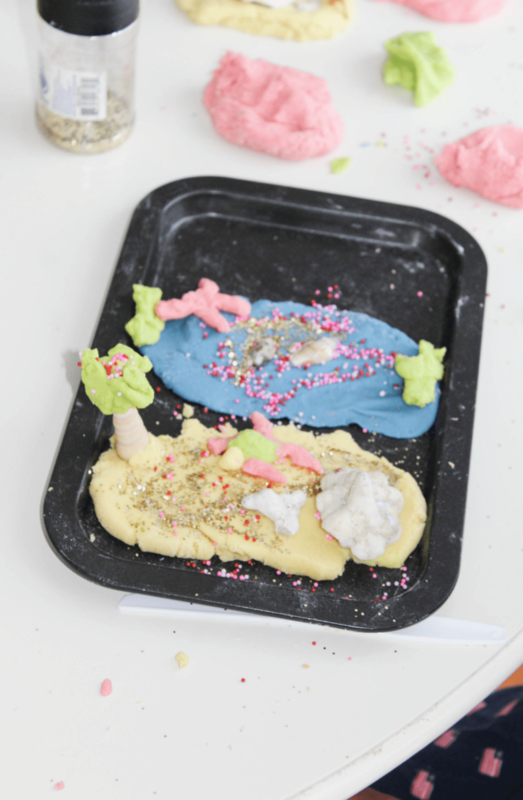 That’s why I love that playdough can be made at home. If things like that happens I can just make more. The ingredients are not expensive. 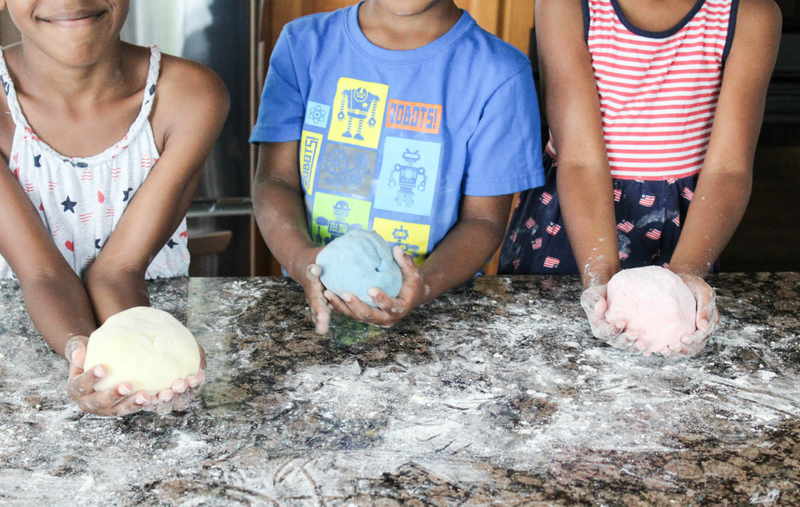 One bag of flour can make multiple batches of playdough and save you from having to spend over and over on playdough. The kids enjoy helping when they can. 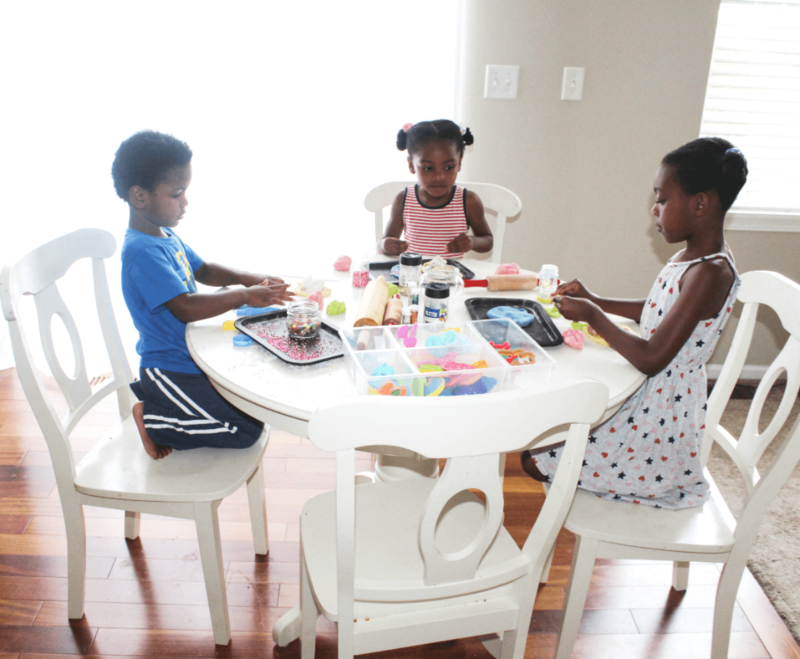 So when I told them we were going to make playdough they were super excited. Except this time I told them we’d photograph the process to share. 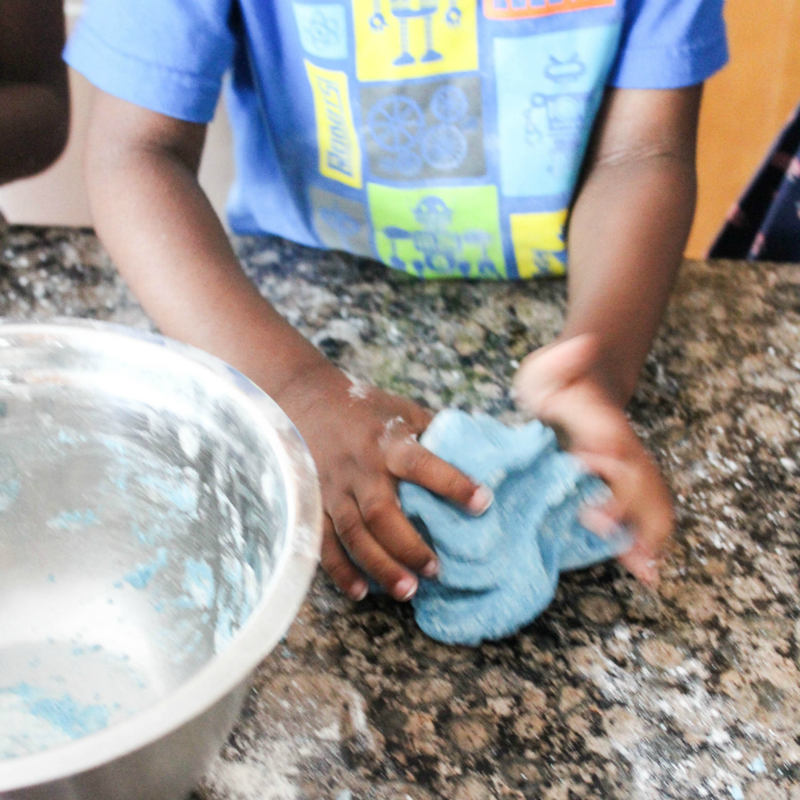 Although we always make playdough it had been a few weeks since we did because we were in the midst of moving. 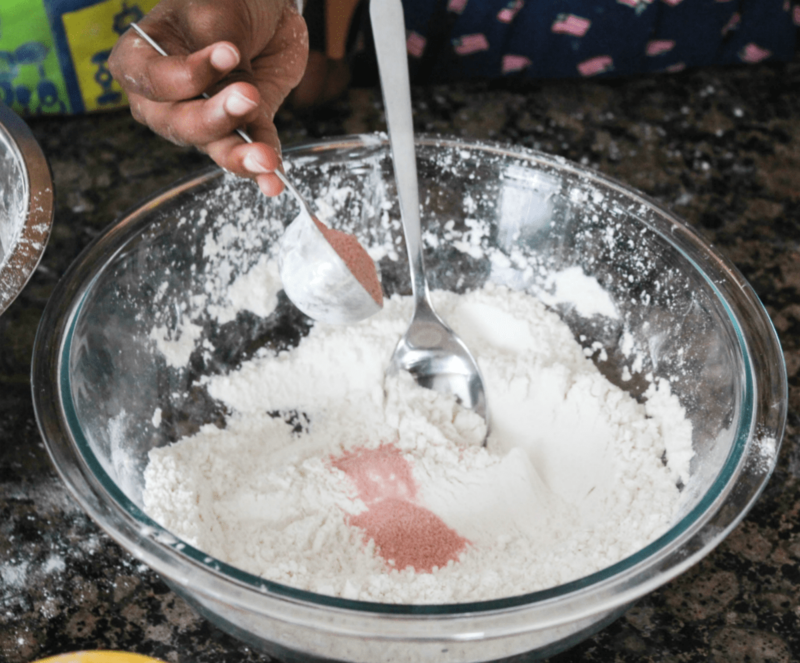 Mix dry ingredients in a bowl. If using Jello or Koolaid add it in. Set aside. 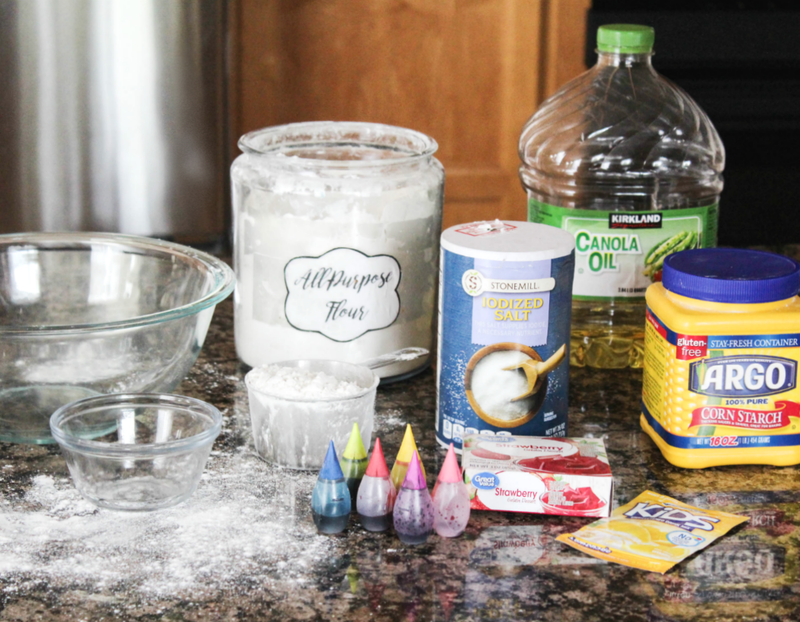 Mix water and drops of preferred food coloring. Important: The food coloring must be added to the water first before adding the oil. If you add the food coloring after adding the oil the color will turn out in tiny balls and won’t mix well. Mix in the oil. Oil bubbles will remain on the top because oil and water don’t mix well. But stir it in anyway. 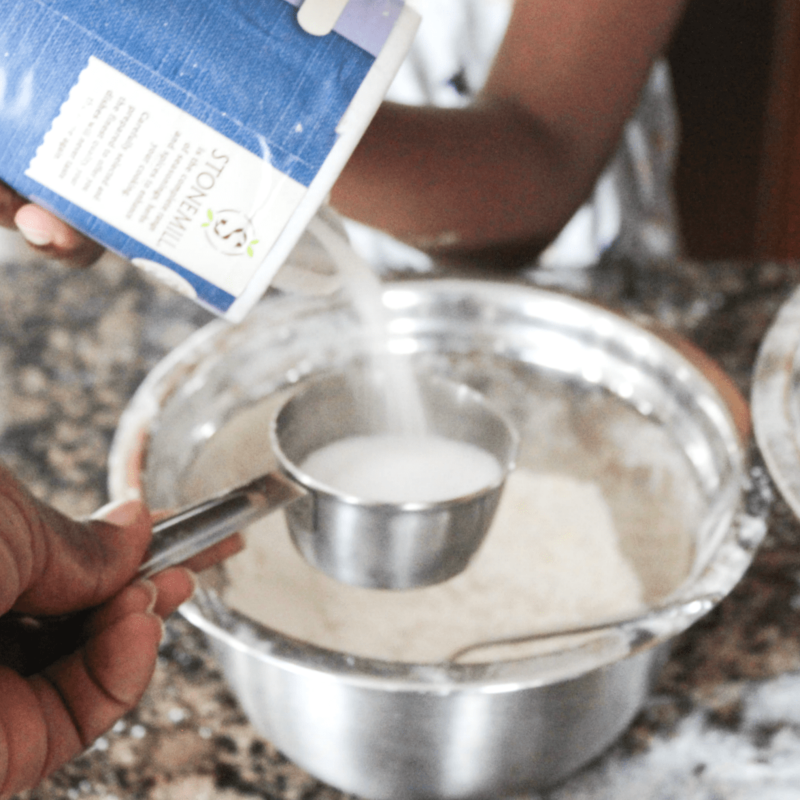 Important: Don’t just pour the oil by itself in the dry ingredients. It’s not enough to make the full batch full wet. It will just make little clumps. So add it to the water instead. Pour liquid mixture over dry and stir until all the dry mixture looks wet. 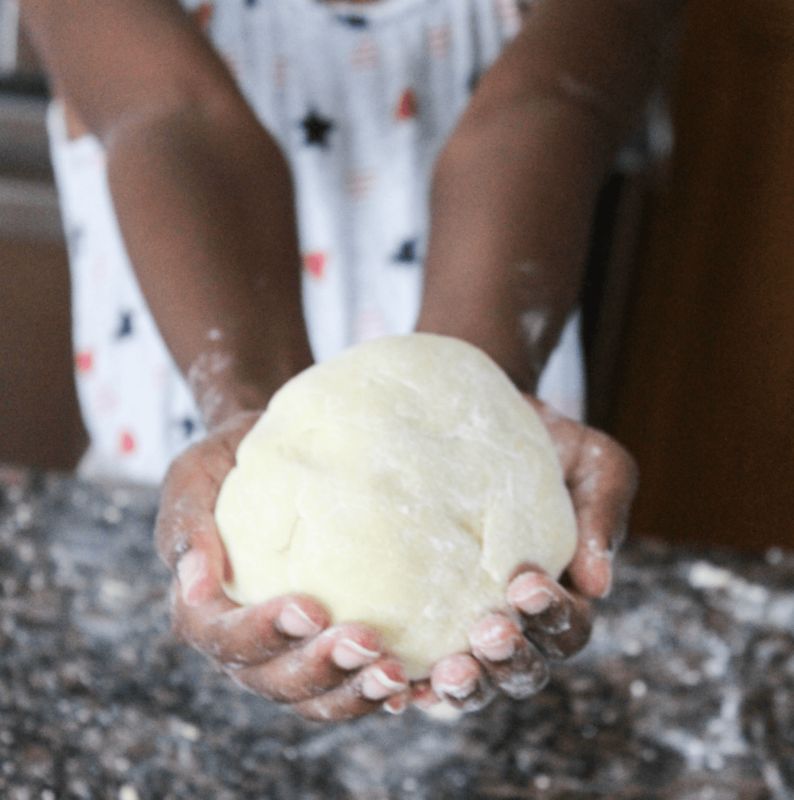 Using your hands, gather the dough together in one. 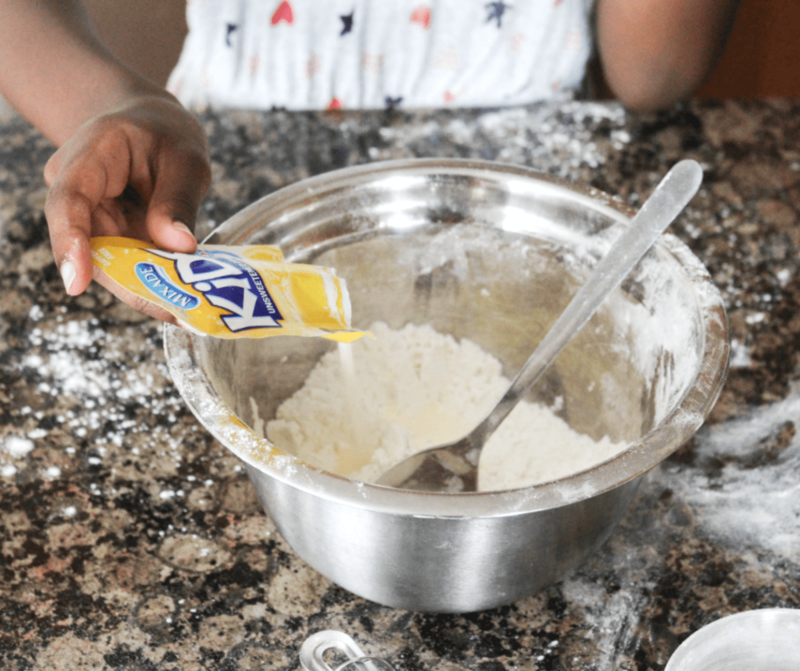 If it seems too dry add a little bit more water (1 teaspoon at a time until it reaches to a soft playdough consistency). If it seems way too sticky add some more flour (begin with a Tablespoon at a time). 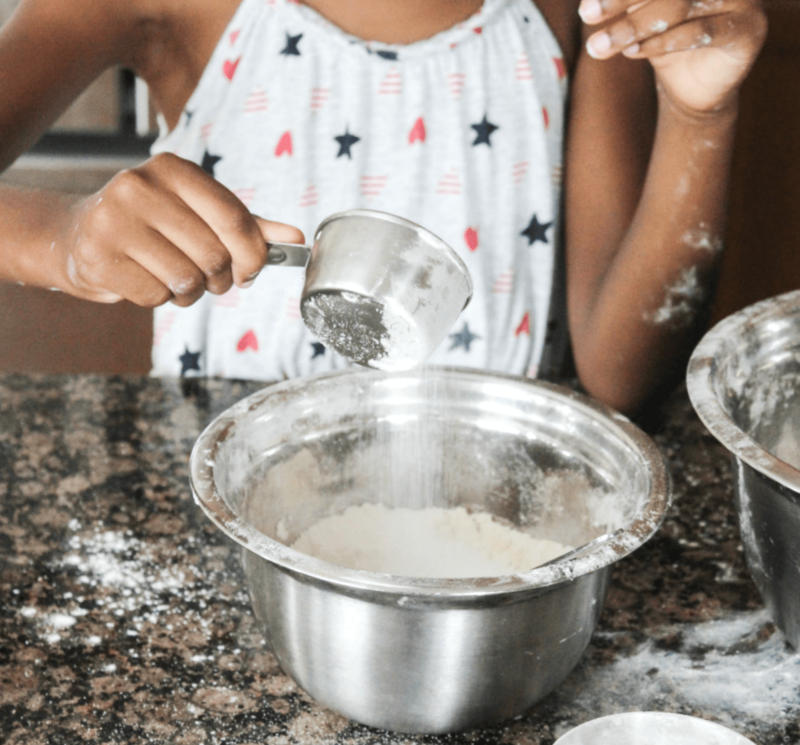 Sprinkle additional flour unto the counter or cutting board and knead the dough until it forms and feel right to the desired playdough consistency. 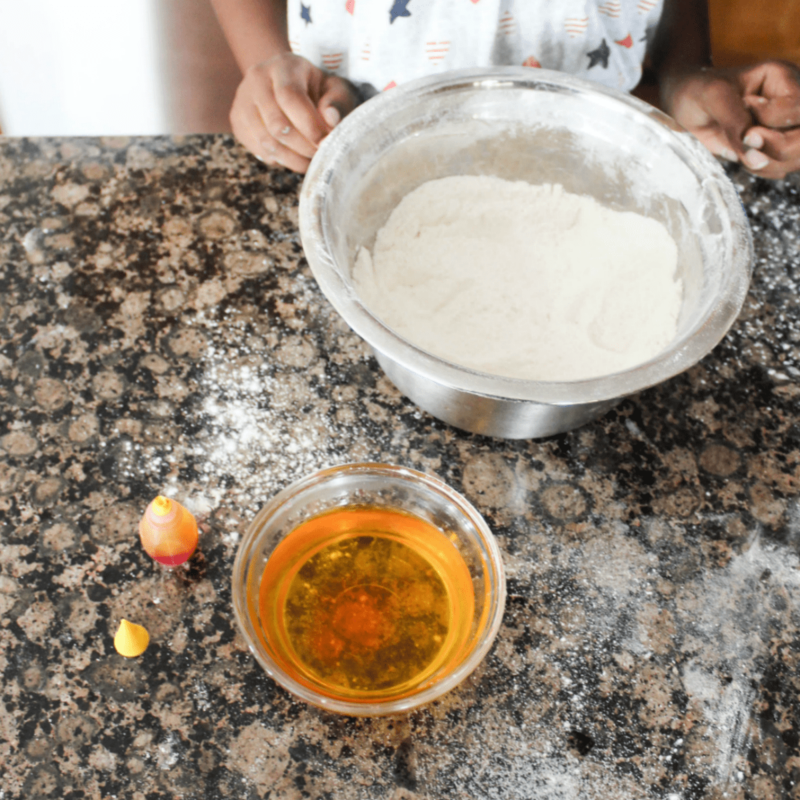 Have the kids help measure (if they can) and pour the ingredients. I usually measure the ingredients and have them pour them in. But I am sure our 7 year old can probably measure if I show her how to (I just hadn’t taken the time to do so). 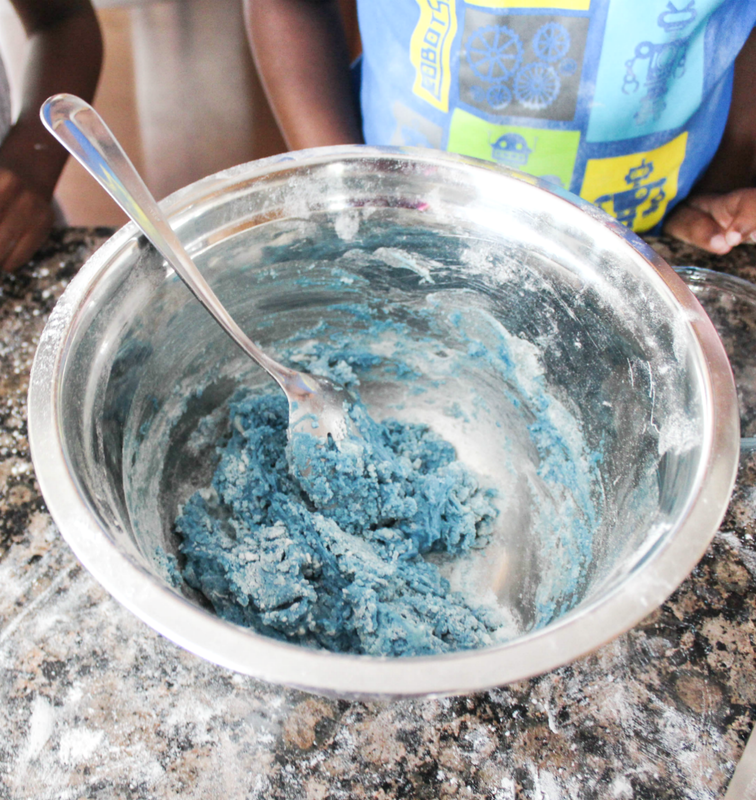 Jello and kool-aid powder give play dough a really nice pleasant smell. 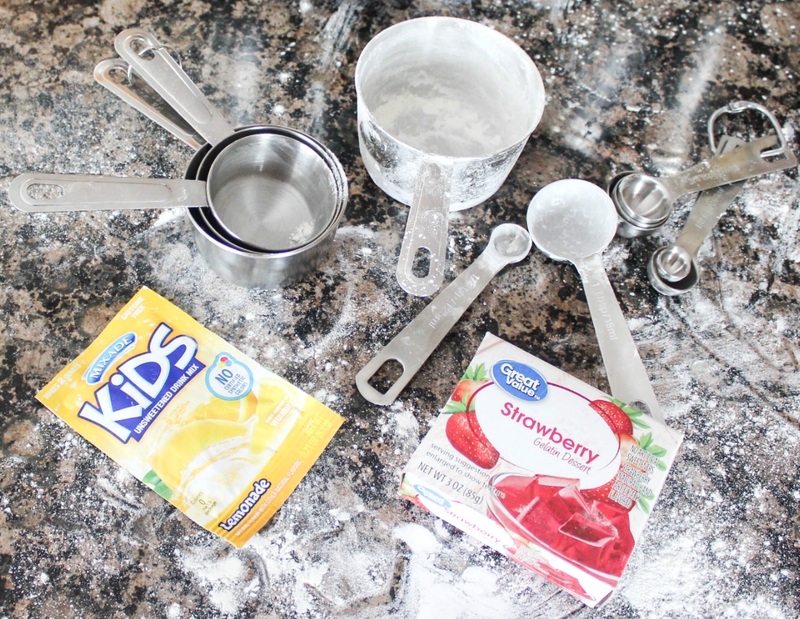 I love adding just a tablespoon jello or an entire bag of koolaid to the recipe. The kids love smelling them too. Note: Food coloring is not necessary if you use Kool-Aid and Colorful Jello but it does enhance the color. We added some to make the colors pop some more. Each kid chose the color they wanted and we added scents or food coloring to get the result (both will bring out the colors even more). I didn’t have any blue Jello, Koolaid or anything of that sort so we only used the blue food coloring. Important: The food coloring must be added to the water first before adding the oil. If you add the food coloring after adding the oil the color will turn out in tiny balls and won’t mix well. 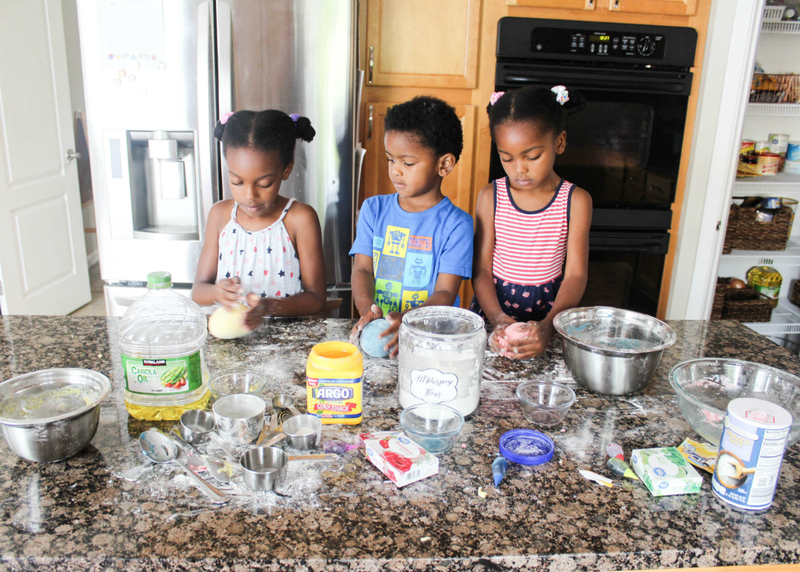 After all the ingredients are in have the kids mix them with a spoon just until combined. 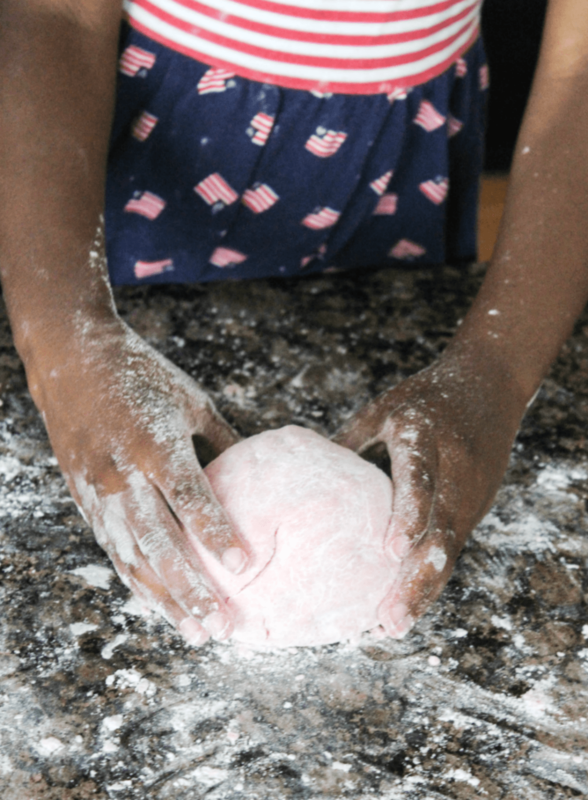 Remove the dough from the bowl and let them knead it until smooth (you help where necessary). 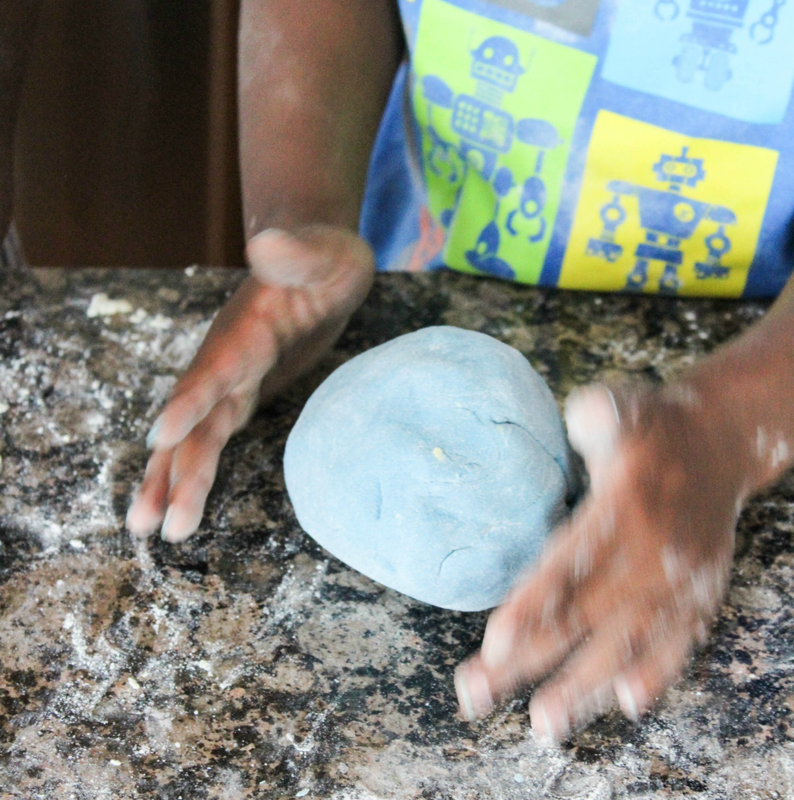 Everyone enjoyed rolling their play dough and seeing how they all came together. 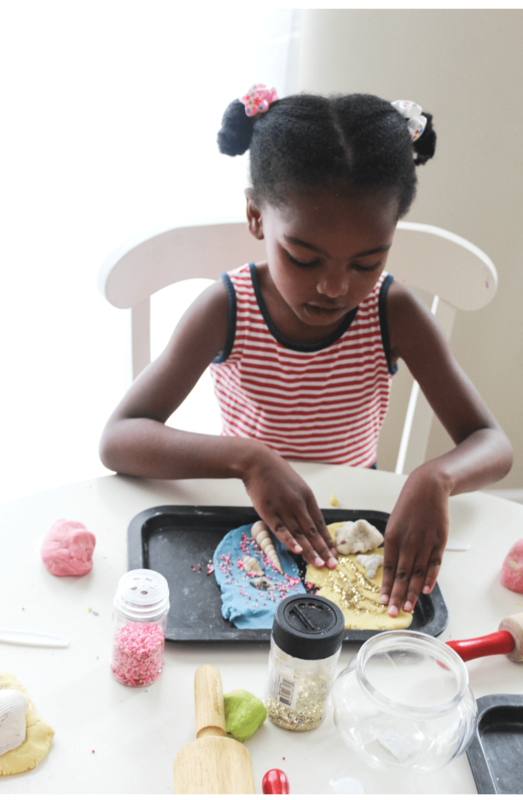 Making play-dough is so much fun for kids and they love having a part in making it. 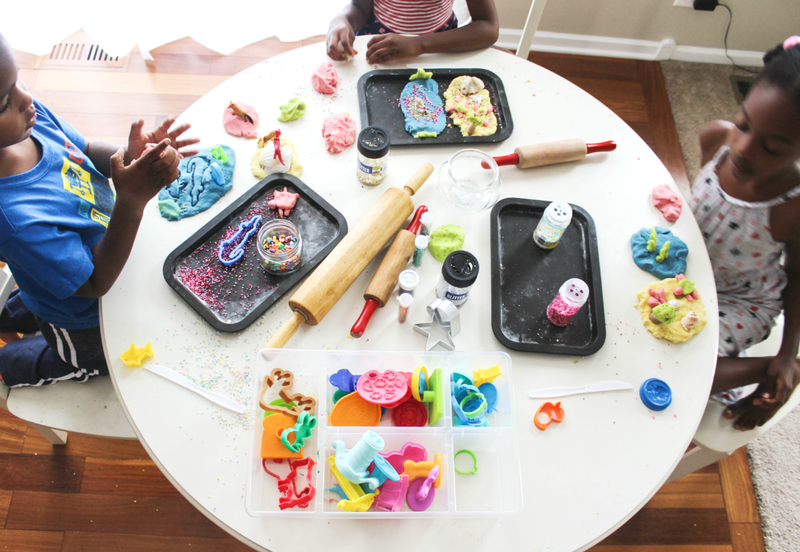 Once everything is done, set out or have the kids get their playdough cutters and rollers to start creating. We love to add things like sprinkles, glitter, sequins, colorful beads, shells, and other small decorative items. They all love eating the sprinkles! Always remember to check the age recommendations on some of these before giving them to small kids. Our 3 year old son loves to add small animals and pretend they’re at a jungle. And these are creations from another time we made play-dough and their creations looked so fun that I decided to snap some photos of what they made. Don’t the cookies look like something you’ll want to eat? 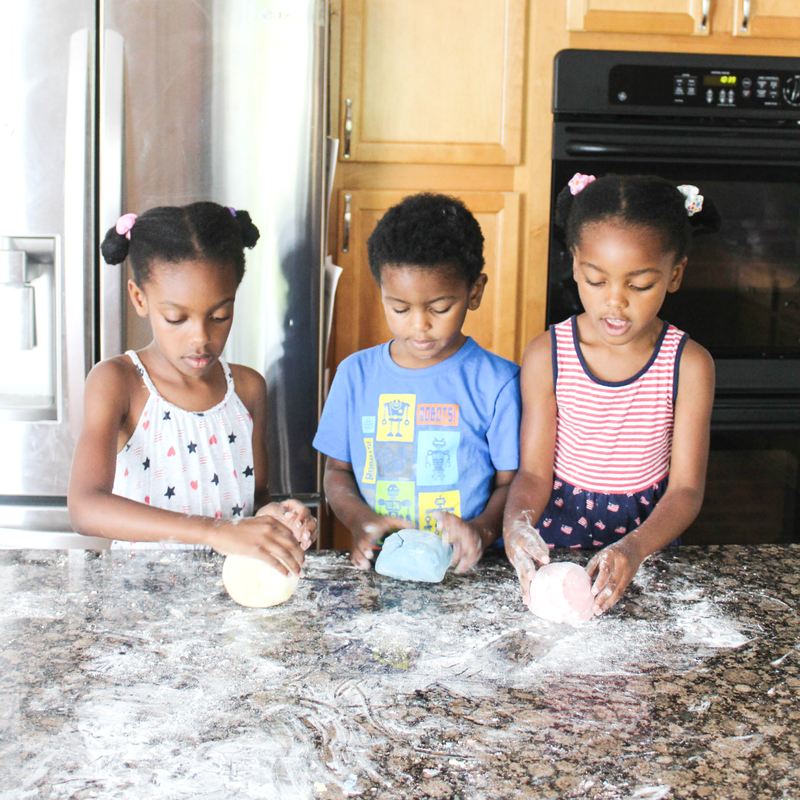 Do you have small kids at home who still enjoys play-dough? Do you have any fun recipes or do you simply buy them from the store?